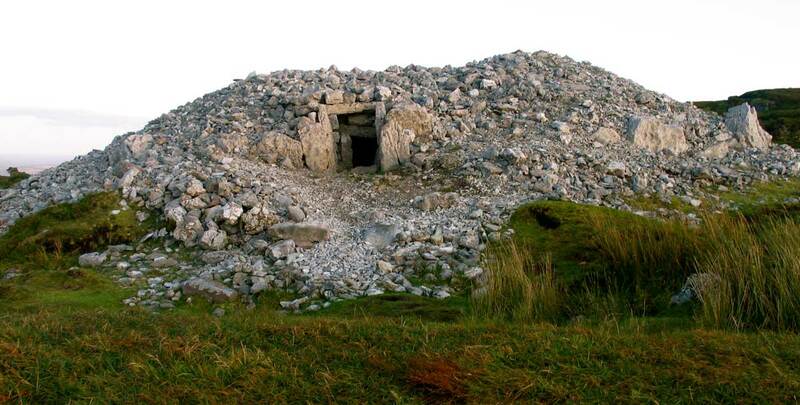 Looking into the entrance of Cairn H at Carrowkeel. This monument suffered badly in 1911: the diggers tunnelled in through the roof and left the cairn in an untidy mess. Cairn H is about 75 metres south of Cairn G and is in a pretty ruined state with a damaged roof and caved in chamber. When Macalister dug this monument in 1911 it was recorded as being nearly 30 metres in diameter, which would make it the largest monument of the group. Looking into the entrance of Cairn H on the full moon. 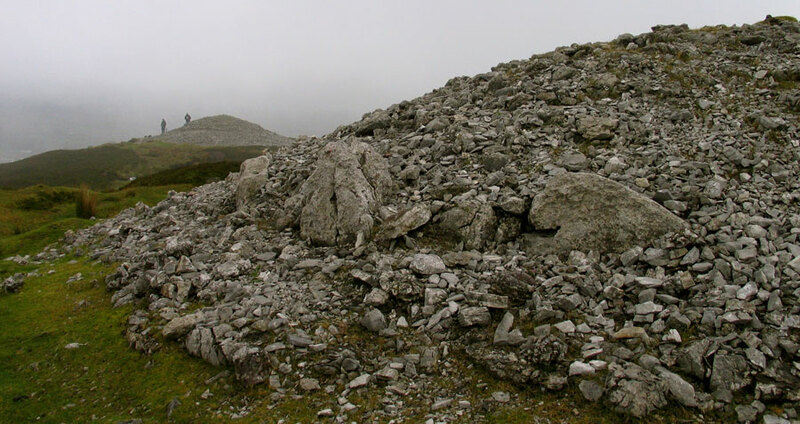 However, Cairn H, like most of the other cairns about 20 metres in diameter. 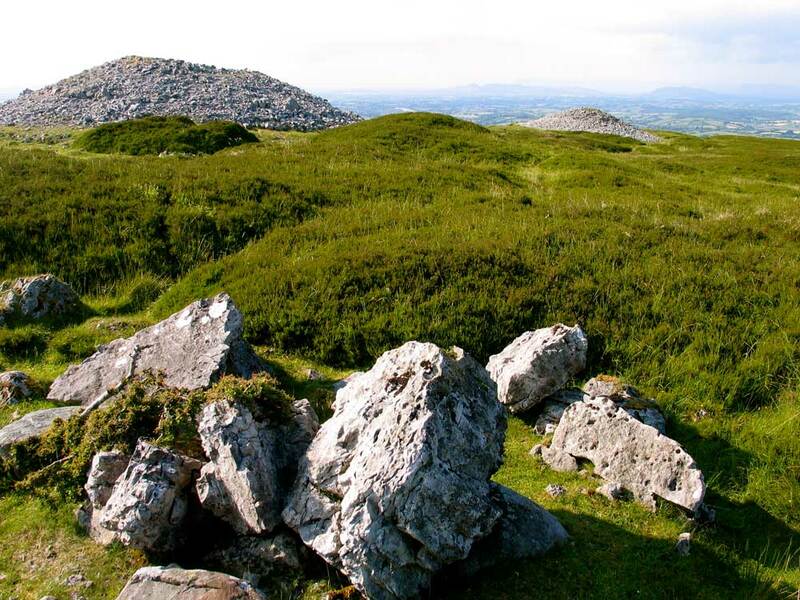 It has a double row of kerbstones one kerb 2 metres inside the other, the only such example in Carrowkeel. It is worth spending some time looking around this cairn: there is a small mound which may be the remains of a Bronze age cist to the right of the entrance, and what appears to be a collapsed dolmen a few meters to the south. The dolmen can be seen in the picture below as a tumble of stones in the foreground. Cairn H and Cairn G, with the remains of a dolmen or stone table in the foreground. This was the only cairn the excavators found with its entrance open, but the passage was blocked by a fallen stone not far in. They entered the chamber from above by removing tons of roofing flags and stones, supposedly with the aid of dynamite, and are responsible for the present state of the monument. 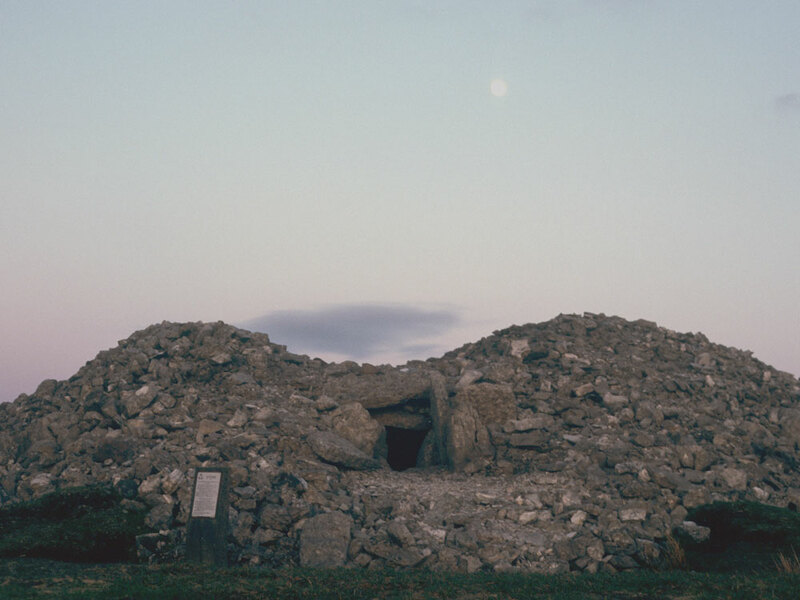 The cairn proved to contain a pentagonal chamber at the end of a curved or bent passage, which may be a forerunner to the western passage at Knowth. Cairn H is aligned to the sunsets sometime between the equinoxes and the summer solstice and is probably also aligned to the setting of one of the minor lunar standstills. The entrance of this structure was found open, unlike all the other perfect carns of the series, and had evidently been open for a very considerable period, if indeed it had ever been closed. It was, however, impossible to make use of it as a means to enter the chamber, as a slip of one of the side stones of the passage had narrowed too much to admit a person creeping through. We were accordingly obliged to cut down through the middle of the carn, and to get into the central chamber through the roof. It proved to be merely a square cist, 5 feet long, 3 feet 3 inches broad at the inner end, and 2 feet 10 inches high, approached by a narrow and awkward creep-passage, roughly built, widening broad at the approached by a narrow and awkward, widening just inside the door, though nowhere high enough to permit one to stand upright. The passage (exclusive of the 5-foot length of the cist) is 22 feet 3 inches long; the width ranges from 3 feet 6 inches to 1 foot; the maximum height is 2 feet 10 inches. 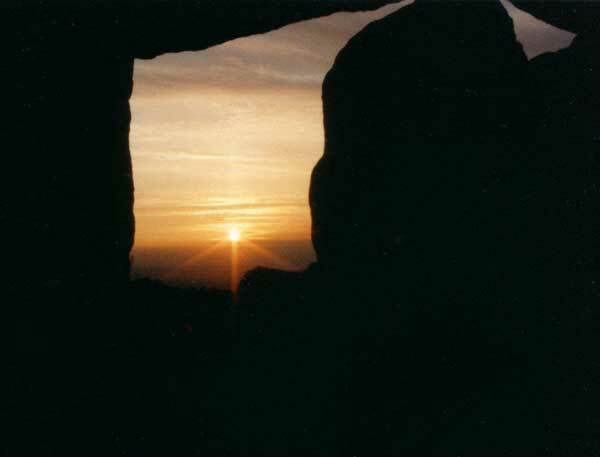 Sunset some three weeks before midsummer at Cairn H.
The accident must have happened while the carn was still in use, as interments were found both inside and outside the spot where the stone had slipped the latter having presumably been deposited after the blocking of the passage barred the entrance to the central cist. This is the only carn of the series with a double row of kerb-stones surrounding its base. There is a space of 5 to 7 feet between the two rows. The inner kerb is composed of larger stones, which are about sixty in number. The diameter of the carn at the base is about 100 feet, its height about 20 feet. The plan and section of this carn and of the entrance passage and chamber will be found on Plate XXII; Plate XIV, fig. 3, shows the carn (with Carn G in the distance); Plate XIV, fig. 4, shows the entrance. This photograph was taken after we had cut down on the lintels. Looking from Cairn H to Cairn G at Carrowkeel. The large limestone slabs of the inner kerb are visible. The outer kerb seems to be of smaller sandstone boulders.